"Don't treat me like a child!" Seung Mina was born into a strict family of martial arts teachers. 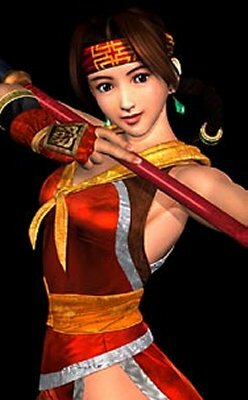 She had grown up surrounded by weapons, and had an excellent knowledge of martial arts. In fact, her horsesword technique surpassed even that of her father, Seung Han Myong. However, because of her cute looks, she had been teased by the neighborhood boys. Her father had taught her discipline, but she nonetheless often beat the boys who teased her. Her father wanted her to stay at his dojo at Chii mountain in Korea, but the strong-willed Mina had other ideas. Korea was in serious trouble. Invasion by outside forces had been avoided only because the neighboring countries were experiencing internal problems. However, Japan ended their civil war and prepared for foreign conquest. In preparing for a possible invasion, the patriotic people of Korea began to fortify their coasts. The famous Navy admiral Lee Sun Shin led the newly formed Coastal Defense Force. Mina too was caught up in the patriotic fervor, and tried to join the defense force, but was barred from serving because of her gender. Hwang, a student from her father's dojo and a member of the defense force, told her father of an important mission he was undertaking. He was to find the legendary Patriot Sword, Soul Edge, and bring it to Korea. Seeing this as a way to help her country, Mina decided to leave home and travel to the west to find Soul Edge. She had barely left home when her father caught her, but she had made up her mind and he had no choice but to let her go. Her journey did not last long. Hwang, hearing the news that Korea had indeed been invaded, abandoned his quest and returned home. He met up with Mina along the way and took her back home. When she returned, her father was releived to see her, but ordered her to begin a rigorous training session as punishment. Meanwhile, Han Myong had asked Hwang to become his son, and even though Hwang had respectfully declined, Han Myong was already thinking of a marriage between Mina and Hwang. Mina had no desire to marry Hwang, however, because his volunteer duties kept him away from Chili-san most of the time. Her recent adventure had given her an increased sense of freedom, and she felt ill at ease about such a marriage. The marriage proposals did not stop there. The prodigal son of the wealthy Kim family, who was also a pupil of the Seung school, proposed to her one day. This was the last straw, and Mina ran away from home again. The problem was that Mina had nowhere to go. She could not enter the Coastal Defense Force because she had been rejected, and Admiral Shin and her father were good friends so he would surely send her back. She decided that she would search for Soul Edge yet again. The Force would surely accept her if she found the Patriot Sword. Her father and Hwang would also be forced to recognize her independance. She set out on her quest immediately. After a few months, Mina finally reached western soil. She heard of a female fighter named Ivy who was searching for Soul Edge too, so she tracked down the fighter. Mina was slightly uneased that Ivy referred to the Patriot Sword as the "demonic blade." Ivy sensed her unease and began to taunt Mina. Angered, Mina raised her Zanbato high and challenged Ivy to a duel. Although she wasn't overpowered, Ivy's strange fighting style confused Mina and she was quickly defeated. Ivy turned and left Mina standing in the street. Once the crowd broke up, Mina began to reflect on her journey. If her skills had been useless against Ivy, had her training been neglected? Her skill with the Zanbato had been her source of confidence on her quest, and her defeat left her in denial. Mina turned when she heard the voice of a man jeering at her from behind. The man who addressed her looked to be Chinese, in his thirties or forties, and very drunk. He held a rod in his hands that drew Mina's attention. He continued to taunt Mina, and she lashed out with her Zanbato again. The man simply caught Mina's rod and advised her to learn about her opponents before attacking. Although angry, Mina saw that the man was skilled and asked him if he could teach her to fight. To her surprise, he agreed, and she began training under him. The months passed and Mina continued to train. The man, who she came to know was named Kong, taught her everything he knew and also shared his experience with her. Mina knew that to win Soul Edge she would need to be in top shape, and this was her motivation and she continued to push herself. Kong cared nothing for Mina's tecnique, he taught her simply because of her strong convictions. Day by day her skill grew thanks to Kong. He was still drunk much of the time and his appearance was terrible, but his fighting style and mastery of the rod were unparalleled. A full year had passed since Mina had met Kong. One day, Kong went out to buy some alcohol and never returned. A saddened Mina found a note from Kong that said that he felt he was worthy to teach her the way of the rod. There was nothing more he could teach her and advised her to go forth and complete her quest.